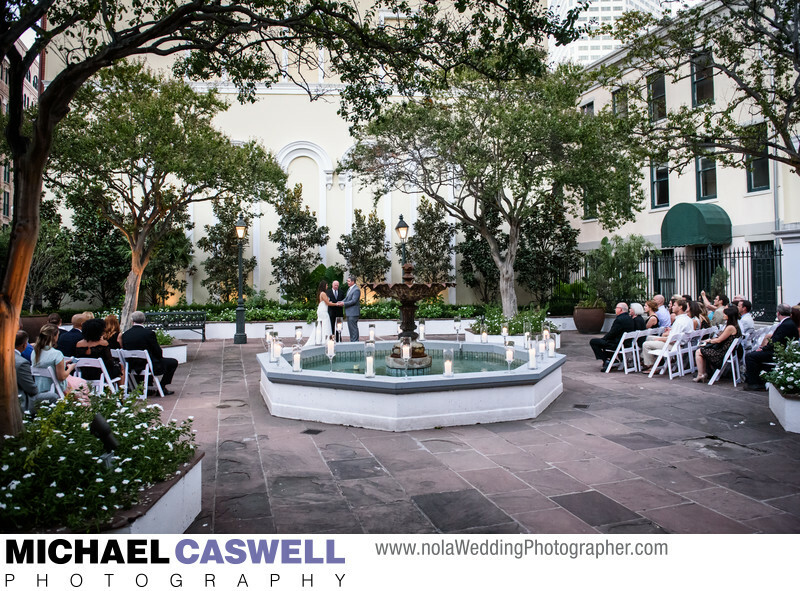 New Orleans Board of Trade is a truly unique wedding venue, located in the downtown area on Magazine Street. It's always wonderful to see magnificent and beautiful old buildings like this, that have outlived their original purpose, revitalized and turned into special event venues. The courtyard is a perfect spot for an outdoor wedding ceremony, such as this event, which took place in the typically mild weather of late September. The spacious courtyard features a large fountain as its centerpiece, as well as numerous trees and lush landscaping. Ceremonies also sometimes take place in the gallery, which is the covered entryway area, which can also serve as a backup in case of rain. 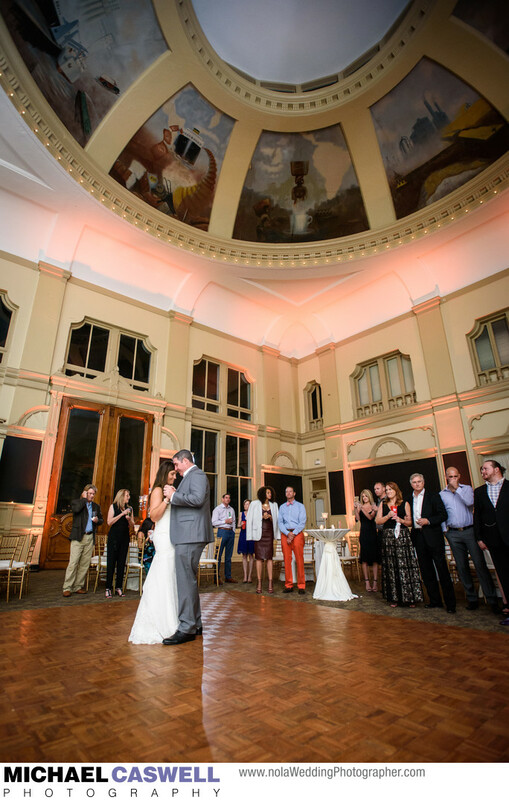 This venue's indoor space is one of just a handful in New Orleans that can accommodate a very large wedding reception. The domed ceiling mural, painted in the early 1930s, depicts activities surrounding coffee beans and other commodities that were traded on the floor in its heyday. Pigeón Caterers provides the excellent food for events here. The courtyard is also typically utilized during receptions, providing an outdoor space for guests to relax in and converse away from the loud music of the party. This is the case even if the ceremony took place here, as the staff will come through and rearrange the space. 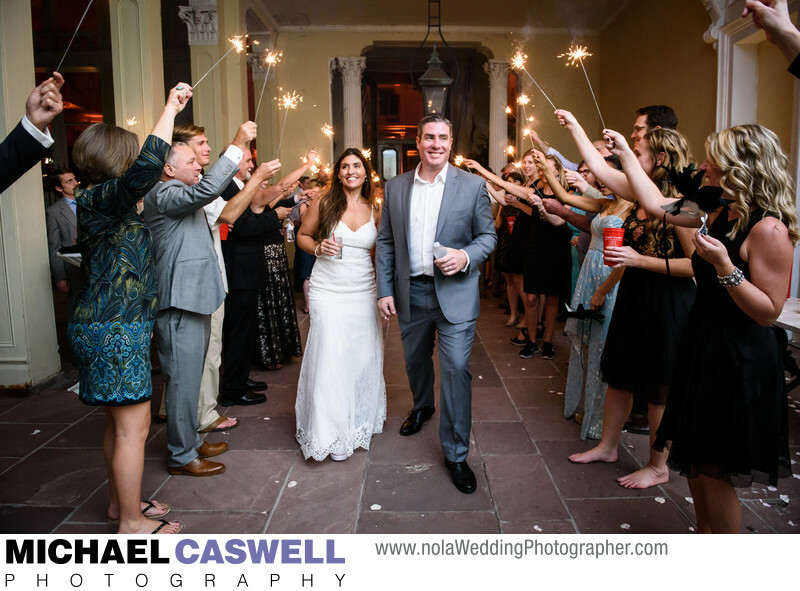 The gallery makes for the perfect spot for a sparkler send-off at the end of the night! Location: 316 Magazine St, New Orleans, LA 70130.